There is nothing glamorous about self-defense, but the singular rule that applies is that to defend yourself, you need to have the means to do so. Car-jackings are hitting all-time highs in some areas. Chicago recorded nearly 1000 incidents in 2017 alone. There is no sign that the situation is improving. The problem with concealed carry is that often, concealed carry holders don't, for reasons of inconvenience. The chances of being forced to use a gun in self-defense are low. I've had to exactly once in my lifetime. Without the means to defend yourself, you are a soft target, essentially defenseless in many cases. The North American Arms BUG II is available as a .22 WinMag, or as a combination of two supplied cylinders, one .22 LR and one .22 WinMag. Either way, you have five shots at your disposal with a minimum of bulk and a maximum of reliability. The BUG II has a 1-1/2 inch stepped barrel and an XS Sights Big Dot front sight. The XS Sights Tritium front sight is a very good addition, for an estimated 70% of defensive gun uses happen in compromised light conditions. This is a TALO distributor exclusive with wide-spread availability. Your local pro shop should have little problem getting one in for you in a jiffy. I just checked Davidson's “Gallery of Guns” for the combo set I'm working with. The price in this area (Naperville, IL) is $304.99 including $24.99 in dealer fees and $24.80 in Illinois sales tax. The Magnum Bug II is a bit less, as it comes with the .22 WinMag cylinder only: $272.99 out the door in this area. Of course, individual dealers set their own prices. The rubber, pebbled texture slip-on grips by Hogue are not the most beautiful that NAA offers, check their website for many other options, but they are among the most functional. The cylinder pin is called the “Sheriff Style,” with a serrated surface that makes it easy to pull out the pin to reload or to change cylinders. The back of the stepped barrel is channeled, to make sighting quicker, easier, and more accurate. As with most all North American Arms product, the Magnum Bug Combo comes very nicely presented with a metal, lockable, well-padded hard case. Hornady FTX 45 grain “Critical Defense” .22 WMR loads deliver roughly the same penetration in ballistic gel (9-1/2 inches) as .380 ACP rounds, and it is loads like this (with low muzzle flash propellants) that give the Bug its significant bite. The Bug II is easy to hang on to and quite controllable with .22 WMR loads. It doesn't take much shooting before you appreciate the Hogue grips and the XS Sights Big Dot / channeled frame sight picture. The Bug II works well as a anti-carjacking device, as a back-up handgun, and is something that fits almost anywhere, from biker wallets to women's accessory purses. 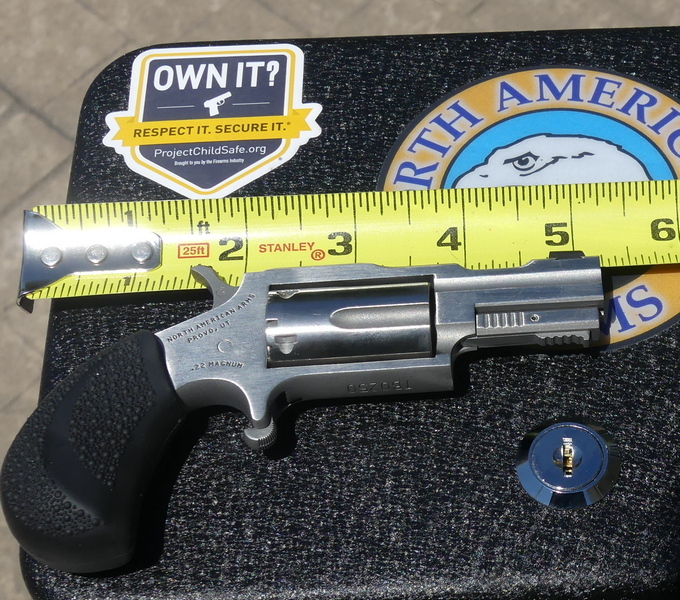 Our idea of a “pocket handgun” sometimes has a lot to do with the size of our pockets. The Bug II is pocketable by essentially everyone. The classic Safety-Notch NAA cylinders make this little gun safe to carry, and safe to drop although dropping isn't a fabulously grand idea with any firearm. You can expect around 950 fps or so muzzle velocity with Hornady 45 grain Critical Defense ammo. Though the polar opposite of a target rifle or target pistol, the BUG-II (like all NAA Mini-Revolvers) has no problem putting hits in the A-zone at intimate defensive ranges. The Bug-II is the fix not for all the times that you do have full-size handgun at the ready, but for all the times that you do not.